Things are not good in the Gaza Strip today. The 25 mile long sliver of land borders on Israel and is the crowded home to 1.7 million Palestinians and the controversial ruling party Hamas. If you've checked any news or social media today- you've no doubt seen articles, tweets, and pictures of the violence and destruction occurring in the Gaza Strip. 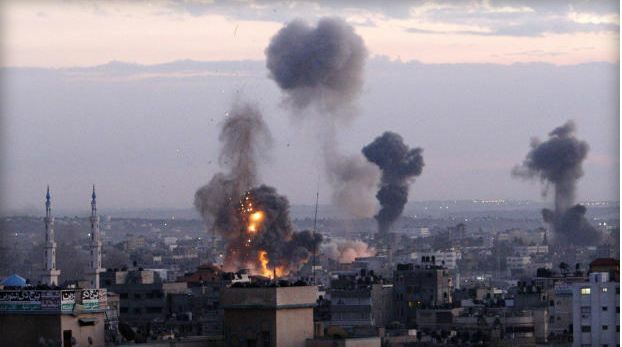 Beginning on November 8th, Israel has conducted a series of attacks in Gaza, in response to months of rocket fire into southern Israel from Hamas. The first target and victim of these attacks was Ahmad al-Ja’abari, the leader of the military wing of Hamas. USDemocrazy understands that the "fog of war" is just as prevalent (if not more) in the media, as it is on the ground. "Gaza in Pictures" from flickr; a timeline of photos over the past few days, complete with descriptions. Amnesty International's brief report from today, calling on BOTH sides to end indiscriminate violence. The international community must put pressure on both sides to fully respect the laws of war and protect civilian lives and property. The Institute for Middle Eastern Understanding's (IMEU) "Watching Gaza" twitter feed, where people in Gaza are providing real-time updates from the civilian point of view. Drones. F16. Raid. Apache. Martyr. Unconfirmed. Confirmed. Ambulance. Sirens. North. East. That's what we've seen for hours. Israeli Prime Minister Benjamin Netanyahu has said that Israel has sent a "clear message" and Hamas vows "we will respond." Not a good sign for a happy resolution to the conflict. In the upcoming months and weeks , we at USDemocrazy will be chronicling the Middle East on many issues and from many perspectives. Stay tuned.